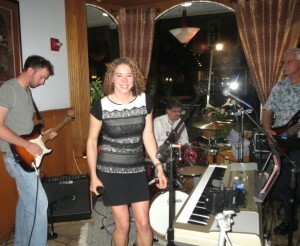 The members of Jack’s Fault, a local rock and blues cover band, include Sean Patton (from left), Jo Huxster, Ken Genovesi, and Robert Huxster. A Kennett Square resident who visited the borough’s La Verona restaurant last month did so at the urging of friends who recommended the band that plays there on First Fridays. Even more surprising for Carl, Dr. Robert Huxster turned out to be a member of the highly-touted band Carl had come to hear. On second thought, Carl suggested he’d been at least subliminally prepared for that revelation: “He did have Beatles music on while he operated,” Carl recalled. Such serendipitous connections are nothing new for Jack’s Fault, a blues and rock cover band that has made a specialty out of forging and maintaining ties in the community as well as within one local family. The group was started by Huxster’s 29-year-old daughter Jo, and his wife, Barbara Forney, helps with sound. Jack Marshall (left) listens as Barbara Forney makes sounds adjustments during a performance by Jack’s Fault at La Verona Restaurant in Kennett Square. The true genesis of the band dates back more than two decades when lead singer and pianist Jo Huxster was 6 and aspired to stage fame, she said. Fortunately for her, she says now, her parents supported her musical interests but not her ambition to be a child superstar. Higher education was a family absolute – her father is an orthopedic surgeon and her mother a veterinarian. So Huxster had to content herself with music lessons. Still, she managed to find limelight opportunities. She sometimes sang with her late uncle’s rock ‘n roll band – an odyssey that had her singing in bars with the Midnight Groovers when she was 9. As a teenager, she graduated to belting out “Tomorrow” in a Unionville High production of “Annie.” “I loved acting and being on stage,” she recalled. But academics beckoned, and the 2003 Unionville High graduate headed to the University of Delaware. Ten years later, she left with a doctorate in marine studies. She now works as a visiting research professor at Drexel University and an adjunct in environmental science at St. Joseph’s University. And with her thesis behind her, she said she realized she could return to one of her favorite avocations: music. Consistent with the band’s unconventionality, the daughter provided the impetus for her father to join the fledging group about a year ago. “I sucked him in,” she acknowledged, adding that he plays bass guitar and harmonica. But he was the one most responsible for the name, she said. “My dad thinks it’s the best joke,” she said. It refers to revered Kennett Square music teacher Jack Marshall, who provided instruction to her, her father, and the group’s first guitarist, Jon Cohen. Although the group’s drummer, Ken Genovesi, never studied with Marshall, he’s now guilty by association, Huxster suggested. She said it was her father who informed Marshall of the moniker, and since Marshall continued to attend their performances, he must have been OK with the slightly irreverent tribute, she decided. Jo Huxster takes the mic and works the room during a performance of Jack’s Fault. Marshall, who plays at La Verona every Thursday night, is frequently in the audience when Jack’s Fault takes the stage there. He said he enjoys listening to them, is “absolutely pleased” with their work – and happy to shoulder any blame. In another chance link to the past, the group’s new guitarist is Sean Patton, the grandson of Charles F. Patton, whose name appears on the Unionville-Chadds Ford district’s middle school that Huxster attended. Cohen left Jack’s Fault recently to pursue his dream of becoming a military diver, Huxster said. The group practices one night a week at Huxster’s childhood home, a farm in Newlin Township that also accommodates three dogs, a cat, and 10 horses. She said the band works well together, despite age ranges from 20s to 60s. In addition to the standing, monthly gig at La Verona, Jack’s Fault does selected events and private parties – and would like to do more. “We all have day jobs, but there’s room” for additional music events, she said. 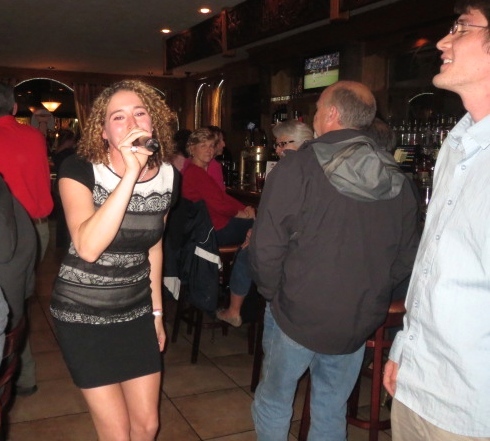 The group exudes a fun-loving vibe that is accentuated when Jo Huxster takes the mic and traverses the length of the bar at La Verona, stopping to give up-close performances to delighted fans. Besides Marshall, she credits her parents for supporting her musical dreams. She said they met in college, both pursued medical degrees, and always nurtured their two daughters. With her younger sister living in Colorado, Jo Huxster says her proximity to home – she resides in Philadelphia – enables her to continue reaping the benefits of her parents’ involvement. In its latest form, her father creates the sound system, and her mother monitors it on an iPad during performances. “If we did it full time, it probably wouldn’t work,” Jo Huxster admitted. “But I’m happy that it does.” And so are the folks who’ve heard them play. One of them, Unionville High Music Department Chair and Band Director Scott Litzenberg, remembers Jo Huxster as a talented student in the choir and musical programs. 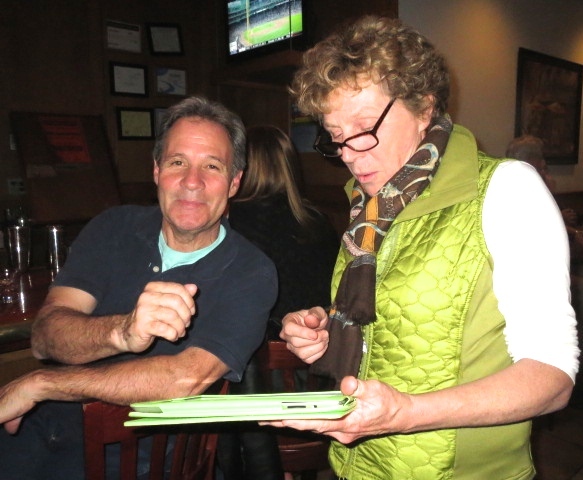 He said when he heard that Jack’s Fault would be performing at Sovana Bistro, he wanted to be there.